Gull-watching is pretty tame along the coasts most of the summer. Many gull species retreat north to nest; a few others nest inland. Along the Atlantic, it’s mostly nesting Herring and Laughing Gulls that stick around through summer. On the Pacific Coast, it’s Glaucous-winged and Western. But by late August, Bonaparte’s Gulls begin arriving along both coasts and at the Great Lakes. Handsome, pale gray Ring-billed Gulls also return to both coasts in late summer. 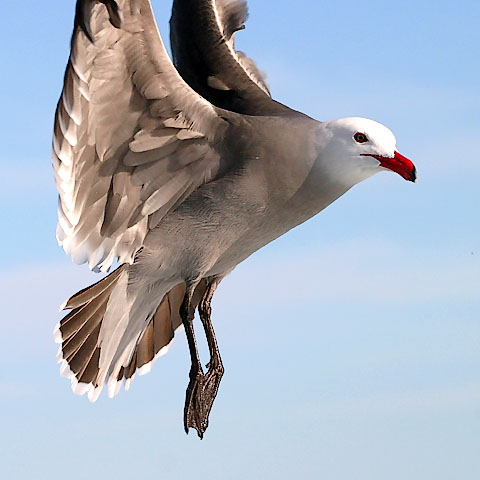 And along the Pacific, the Heermann’s Gull – unmistakable with its blood-red beak – has come just for a summer visit. Sign up for Weekly Preview and see shows and photos for the week ahead. If you visit the beach as summer wanes, you may notice that gulls with different appearances are showing up. Gull-watching is pretty tame along the coasts most of the summer. Many gull species retreat well north to nest, a few others inland. Along the Atlantic, it’s mostly nesting Herring and Laughing Gulls that stick around through summer. On the Pacific coast, it’s Glaucous-winged and Western. But by late August, the picture begins to change. 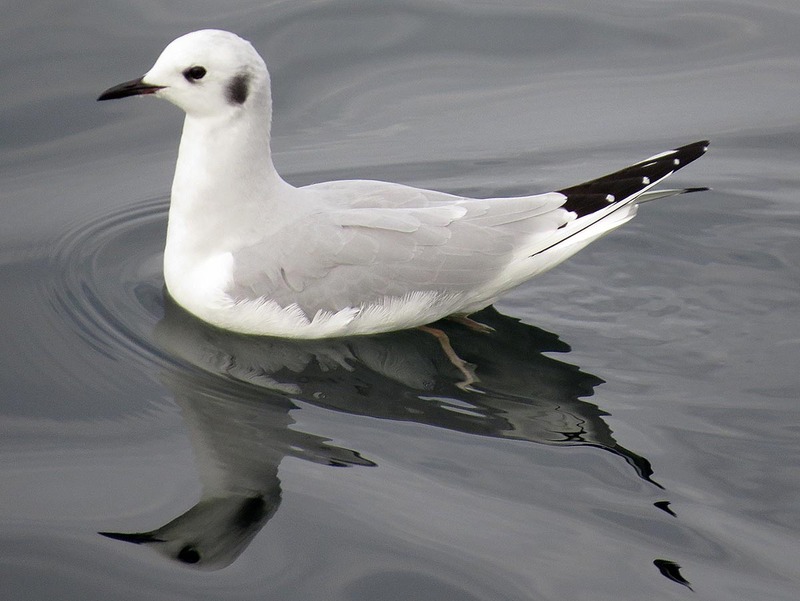 Bonaparte’s Gulls begin arriving along both coasts and at the Great Lakes. These small, sleek, black-headed birds begin flocking south in August [Calls of a flock of Bonaparte’s Gulls]. Handsome, pale gray Ring-billed Gulls also return to both coasts in late summer, most having nested inland [Call of a Ring-billed Gull]. Both species winter along the coasts [Call of a Ring-billed Gull]. And along the Pacific, one very distinctive gull has come just for a summer visit – the Heermann’s Gull. Watch for a gull with a very dark back, a powder-white head, and – unmistakably – a blood-red beak. Heermann’s Gulls nest along the northwest coast of Mexico, disperse northward for a few months each summer, then return south. Can’t always hear BirdNote on the radio? Well, get the next week of shows, every Friday, when you sign up for “Weekly Preview” at birdnote.org. Calls of the gulls provided by The Macaulay Library of Natural Sounds at the Cornell Lab of Ornithology, Ithaca, New York. Glaucous-winged recorded by A.A. Allen, & Bonaparte’s by G.A. Keller & by W.W.H. Gunn; call of Ring-billed Gull by L. Macaulay. Heermann’s Gulls recorded by Martyn Stewart, Naturesound.org.